How's the foetus during week 21? Your baby's growth starts to slow down slightly. There's more activity inside you as there is more amniotic fluid for her to play around in. The foetus' legs are reaching their relative proportions - perfect for kicking you in the kidneys. You might have to stow those killer stilettos for few months, as your ankles and feet may be swelling. Drink lots of fluids and rest with your feet up to reduce water retention. You could suffer from heartburn if you eat spicy or acidic foods, or just plain eat too much. This is caused by oesophageal reflux, in which the stomach contents are pushed into the oesophagus. The measurement from pubic bone to the top of the uterus (fundus) is about 20cm. 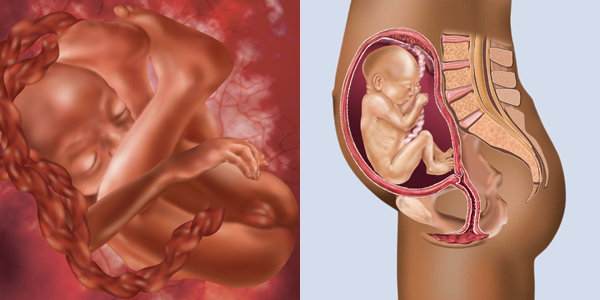 Fundal height is measured to estimate the size ofyour foetus - it eventually stops at 35-40cm. Your blood pressure should be checked by your doctor monthly. A good blood pressure baseline reading gives your doctor an indication of a safe level for you, both during pregnancy and during labour. Sudden elevation in blood pressure could be an indication of pre-eclampsia. Women are no longer confined to home during their "convalescence" (ie. pregnancy). Thank goodness times have changed. What better way to revel in your pregnancy emancipation, than to get out there and get moving? Your baby can recognise your voice and heartbeat now and will feel touch if you massage your tummy. Some foetus's may kick in response to sound - say hello, and see if you get an answer! In fact, scientists have discovered that babies recognise and prefer music that they heard in their mother's womb. This week your baby's unique hand- and footprints form; taste buds start to develop and the bone marrow starts to make blood cells. Studies show that exercising while pregnant not only helps to keep varicose veins, excessive weight gain and backache to a minimum, it can do wonders for your state of mind. Walking, swimming and prenatal yoga are great, low-impact ways to keep fit while pregnant. As always, be sure to check in with your GP/Gynae before starting on your workout regime. To safely build up your endurance for labor and for taking care of your baby later, take long walks outside or on a treadmill, ride a stationary bike. To keep your uterus and pelvic-floor muscles toned, do Kegel exercises and have (lots of) orgasms! Your skin is more sensitive during pregnancy. Here are a few hints to take care of those parts of you under extra strain at the moment in our beauty tips article on 'Skin under fire'. Though your due date sounds very far away, start reading up on baby care now. You won't have time after your newborn arrives.